125 is a composite number. 125 = 1 x 125 or 5 x 25. Factors of 125: 1, 5, 25, 125. Prime factorization: 125 = 5 x 5 x 5, which can also be written 125 = 5³. 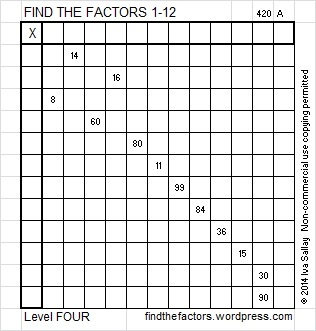 125 is never a clue in the FIND THE FACTORS puzzles. Placing the last few factors on this Level 4 puzzle may be a bit trickier than usual. As always, use logic, not guessing and checking, to find its one and only solution. Good luck!